I’ve got to tell you – when I hear “DARPA” and “US Military” in the same sentence, I tend to think two things: 1) Well, this is going to involve millions of dollars, and 2) I bet my husband would read this article and have fun things to tell me about it tonight over a whiskey. You may be wondering what kind of show we’re running here at the Prevail Project when we choose to come out of almost 2 years of dead air with a woman calling DARPA boring and admitting that she has her husband do her “heavy reading” for her. Consider me the Prevail Project den mother. Consider me a realist. I’m in my last year of law school. I am a writer, and I often take issue with authority. I have 2 grade school age children and a very bright husband who sometimes does me the honor of acting as my operating system – providing a stable consistent way for me to deal with certain subjects without having to know all the details. When I saw what Joel Garreau was trying to do with the Prevail Project it was like the first sight of a living breathing thing stepping into my dormant legal education. I committed myself to the project immediately. In my refusal to pay for University parking, my time with you may be dictated by factors beyond my control; such as my children’s bedtime or whether the schizophrenic mathematician is having an internal or external debate with herself at my neighborhood Starbucks where I drink Americanos and broadcast my brainwaves over the WI-fI to your curious little eyeballs. This is OK though, a former therapist assured me that the more demands one has upon their time the more efficient one becomes – less time for self-doubt and verbosity. Verbosity… this brings me back to my point about DARPA and the Military. I simply do not have the time and or attention span to read about everything that pertains to my future or the pursuit of my happiness. Neither do most of you. Too many authors are verbose, identifying themselves through their interpretation of current events – under the guise of objectivity – alienating too great of an audience with high word counts and the use of terms that must be Googled to be understood. Of course, authors do not intend to separate themselves from their readership. On the contrary, the goal is to unite, to form and feed the connection between author and reader, and then foster that connection among readers who will ultimately discuss the work with others. The fatal flaw in the work of many writers (I am no exception) is that after spending an obsessive amount of time researching her subject du jour, with the noble intention of bringing the information to the masses, the author finds herself setting a table for a seven course meal when the reader is just trying to grab something to go. I acknowledge how valuable your time is, and I thank you for visiting the Prevail Project. If you are here, you are interested in saving the human race and your contribution will not be measure by your time commitment. If you want to spend hours reading and researching ways in which we can face forward – technology in tow – and address our future with a commanding presence instead of a suspenseful wince, GREAT! We’ve been looking for you! You should be a writer for the Prevail Project! Send me a message and we’ll get you established. HOWEVER, if you only have 3 minutes to read something because you’re on the toilet, or in the middle of class –GREAT! Let me take this moment to validate you (Good Job!). This is a perfectly valuable way to take in information, and this is how we want to communicate with out readership so that we can remain connected, accessible and – dare I say – enjoyable. I read Joel Garreau’s book “Radical Evolution,” while my husband is reading Mihaly Csikszentmihalyi’s “Flow.” We may have an exchange at the dinner table highlighting something we found interesting, but kids interrupt, dogs beg, 9 p.m. rolls around sooner than expected and no one has made it to the gym. Yet, every once in a while, the kids get to bed on time, I get to the gym, and at 9 p.m. I am having a cocktail with my husband and we are discussing how Csikszentmihalyi’s theory on controlling one’s ability to have a genuinely satisfying experience and total involvement with life pertains to Garreau’s belief in humankind’s ability to shape technology’s impact on human nature and society in largely unpredictable ways. This conversation can happen anywhere – it can last 3 minutes or 3 hours – Here at the Prevail Project, we just want to be part of that conversation. As for DARPA and the US Military, my husband told me they are using the same deep brain stimulation used in Parkinson’s treatment to help soldiers with Post-traumatic Stress Disorder. I read some more and found that they are not treating PTSD just yet, rather implanting a tiny device within the skull that is capable of recording patterns of interaction among brain regions known to be involved in mental illness. The hope is that electrodes would record neurological data, and then the device could be programmed to deliver tailored therapy to the brain. Joel Garreau would say that this is nothing new for DARPA, whose project managers tend to seek out challenges verging on impossible. Clearly, slipping electrodes into the human brain is a pretty significant endeavor – and it’s not that far out in the future. What are the cultural implications of this information, today? I see one of the nation’s boldest research institutions and the US Military acknowledging mental illness on an engaging and proactive level not typical of how this country deals with mental illness. Whenever I put vegetables on my 5 year-old’s plate he freezes up and refuses to eat anything until I remove the offensive vegetable. Now I tell him, “Don’t think about the carrots right now, eat the parts of your dinner you like, and we’ll get to the carrots later.” As a result he has been able to redirect his focus, finish his dinner and sometimes he eats a carrot. That little bit about researchers slipping a tiny chip into human brains, those are the carrots on your plate. Look past that for now. You will see how great it is that our nation is beginning to acknowledge mental illness in a meaningful way. Celebrities such as Glen Close and Ron Howard participate in an origination called “Bring Change 2 Mind” which works to being an end to discrimination and the stigmatization of mental illness. Well, I recently re-watched Donny Darko the other day, an amazing film about time travel and mental illness which addresses the relevance of the workings of brains we have labeled “mentally ill” when we open ourselves up to consider realities outside of this dimension. I’m not suggesting we consider any particular dimension, but I do think it’s valuable to note that in the past, society has been quick to diagnose and segregate that which is considered mental illness, when today we could potentially explore and learn from it – with technology. By allowing ourselves to consider alternative dimensions, by focusing on the benefits to our society that will come from taking a more conspicuous interest in the workings of mental illness, we as a culture can recognize the ways in which parts of the future we have long awaited are, in fact, happening right now. Technology is not happening to us, mad scientists are not conspiring to put chips into the brains of soldiers to one day control their minds (are they?) – Rather our society is using technology to bring mental illness to the forefront. This needs to be happening now. With all of the effort scientists and engineers are putting into technological developments that could wield unprecedented dangers if they fall into the wrong hands, is it such a strange idea that we as a society start taking some interest in mental health? 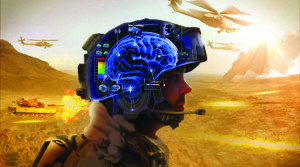 DARPA and the US Military are doing just that – using technology to better understand the mental functioning of damaged brains in the hopes of make observations previously unknown to man. Now that sounds fun. Eat your carrots.